Tom Popik was just looking for a Christmas present, not a cause. Browsing through a bookstore looking for a gift for his oldest son almost a decade ago, he started thumbing through a copy of William Forstchen’s novel One Second After. The book tells the story of a man desperately struggling to save his family and his small North Carolina town after a nuclear electromagnetic-pulse attack wipes out America’s electrical infrastructure. The book struck a chord with Popik (MBA 1988), who was a captain in the US Air Force before attending HBS and had been trained on nuclear threats. Popik began his own research and soon learned that the US Army War College was having a three-day workshop on critical infrastructure threats. He wangled an invitation from a retired general and drove seven hours from his home in New Hampshire to Carlisle, Pennsylvania, where he listened to speaker after speaker from the US Department of Homeland Security, Department of Defense, Federal Emergency Management Agency, and other agencies, describe how America’s electric infrastructure was critically unprepared for any number of natural and man-made threats, including solar storms, cyberattacks, physical attacks, and electromagnetic-pulse attacks. On the second day of the workshop, Popik met Steve Mott, a nuclear engineer who works at the Palo Verde Generating Station, in Arizona, the largest nuclear power complex in the United States. 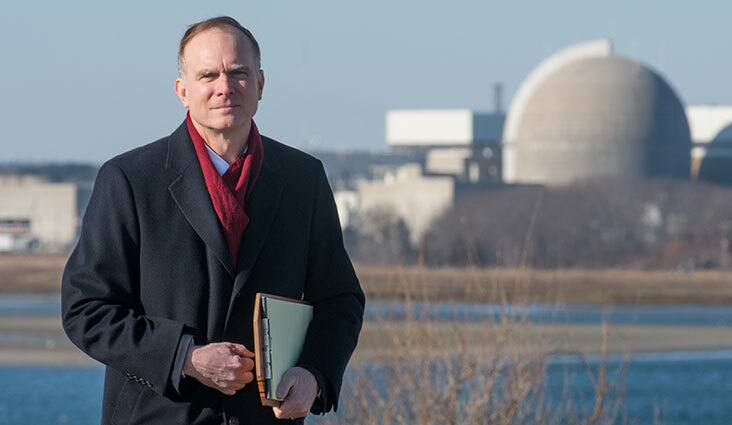 Mott told Popik about a particularly terrifying threat: the long-term loss of electric power for nuclear power plants. If fuel for backup diesel generators were to run out, such as might happen if a prolonged power outage rendered fuel resupply impossible, the water in the spent fuel pools would boil off and cause the fuel rods to catch fire. Plumes of smoke would carry aloft highly radioactive material, distributing it for hundreds of miles. Large areas of America could become uninhabitable. Over dinner, Mott and Popik, who earned a mechanical engineering degree from MIT before attending HBS, vowed to work together on an engineering and regulatory solution. In February 2011, they submitted a 100-page citizen petition to the US Nuclear Regulatory Commission (NRC). In addition to outlining the threat to spent fuel pools, the petition proposed technical fixes to ensure “walk-away” safety, such as solar panels to power unattended electric pumps so they could keep replenishing the water in spent fuel pools. Barely a month later, a massive earthquake struck off the coast of Japan and caused a 10-foot tsunami to smash into the Fukushima Daiichi Nuclear Power Plant, cutting off grid power and drowning the backup generators. The plants’ spent-fuel pools began to boil off—the very scenario Mott had feared—but Japanese emergency crews were able to replenish the spent-fuel pool water in the nick of time, preventing massive evacuation of Tokyo. US regulators took notice. In 2012, Popik and Mott cofounded the nonprofit Foundation for Resilient Societies with a particular focus on the North American electric grid. That same year, the NRC agreed to formally consider Popik and Mott’s spent-fuel pool petition, a regulatory intermediate step that is rare for citizen petitions. The two co-founders recruited top experts on critical infrastructure protection to form its board. Popik serves as chairman and president; sectionmate Paul Schwarzbaum (MBA 1988) agreed to serve as a director. “We aim to protect industrialized societies against the long-term collapse of infrastructure through technical and regulatory solutions,” says Popik, who donates his time to Resilient Societies when he is not running the market research firm Geosegment Systems Corporation, which he founded in 1991. In addition to its advocacy before the NRC, Popik’s group has become a regular at the Federal Energy Regulatory Commission (FERC), the obscure agency that regulates energy infrastructure in the US. When Popik first started attending its public meetings, he says, the lawyers and lobbyists in the room were shocked when he told them he was just “a private citizen concerned about a long-term collapse of the US electric grid.” An attorney told Popik that she had been working with the commission for decades and that he was only the second member of the public she had ever seen concerned about the agency’s proceedings on grid security; the first had been a federal prisoner and therefore unable to attend meetings in person. As regulators and lawmakers have become increasingly concerned about threats to infrastructure, Popik has been called to testify before FERC, state legislatures, and the Canadian Parliament. While specific threats vary, his theme is the same: the US has never had—and is unprepared for—a widespread, long-term collapse of the power grid. Large outages have been short in duration, he says, usually less than 24 hours, while longer outages have been more localized and the areas affected have been able to rely on outside help. The recent collapse of Puerto Rico’s power grid after Hurricane Maria, however, is a frightening example of what could happen if vulnerabilities remain unaddressed. In Puerto Rico, fewer than 100 people died during the storm itself, but the death toll was later revised upward to 2,975 to include those whose deaths were attributable to the aftermath of the storm, including people who were denied medical care due to the collapse of the island’s infrastructure. Outside help was available, but often inadequate. A similar infrastructure collapse on a national scale, Popik says, could result in millions of deaths rather than thousands. That’s why Resilient Societies has been a strong proponent of cost-effective grid-security upgrades. In 2017, Resilient Societies petitioned FERC for a better cybersecurity reporting standard, the first time a citizen group had ever made a petition for grid security. In response, FERC in 2018 ordered a reporting standard that will mandate prompt reporting of a wider range of breaches. In January 2019, the NRC decided against mandating most of the safety improvements proposed by its staff in the aftermath of the Fukushima disaster, ruling that upgrades to handle larger floods and stronger earthquakes are not necessary. On the same day, the NRC also placed aside five petitions from citizen groups. Significantly, the NRC judged that Popik and Mott’s petition for spent fuel pool safety should be kept under active consideration. Popik credits HBS and its professors for teaching him the importance of stakeholders other than enterprise owners. In his first year, he also learned that just a few individuals can affect the course of an entire society. He found Business, Government, and the International Economy (BGIE), taught by Professor Emeritus Jim Austin, to be particularly influential in his thought process around infrastructure protection. “In BGIE, we saw the corrosive societal impacts of self-dealing, within industries and within government bodies,” Popik observes. The Resilient Societies mission statement states that the profit incentive alone, as expressed through normal operation of capital markets, provides inadequate protection from disasters that occur infrequently and have consequences beyond the routine responsibilities of commercial enterprises.